My goodness, now I know I am a rubbish blogger! I haven’t posted for two months again, but since it is raining and I have gotten to the end of the pressing household jobs, I thought I would do an update. 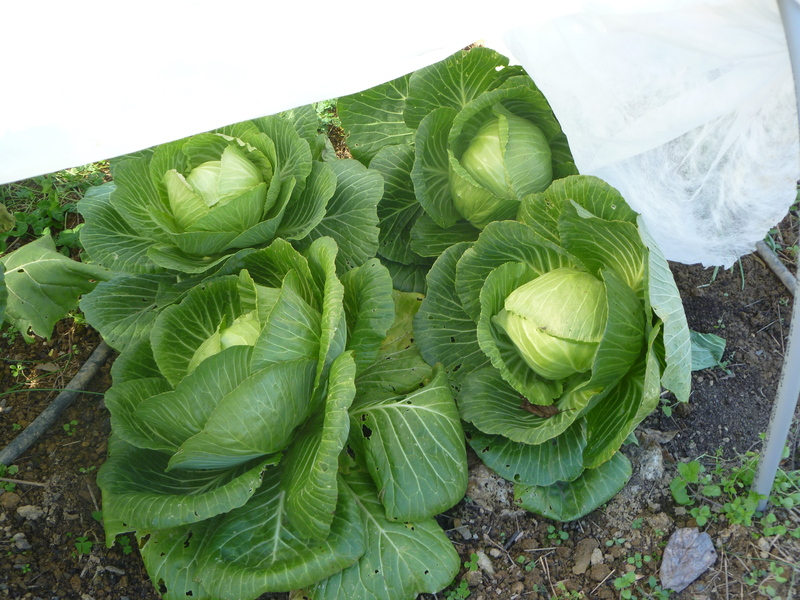 Well, this month has been unbelievable in terms of weather – so warm – it nearly made up for the wet August we had.. I’m not so sure my tomatoes would agree, but my cabbage, lettuce and cauliflower might! I have them under row cover and plastic that I am closing up on cold nights (last night was 50F though, so no need for putting them to bed last night!) and opening during warm days. Quite a lot of work, but they are all looking really good – I hope they mature before the number of hours of light starts affecting them. I have been composting like a mad thing over the last month or so, I collected a lot of leaves from neighbors and friends – with my new toy – an electric leaf vacuum/mulcher (Worx). It works very well but I think I have gotten tennis elbow from hauling it about – plenty of time to get over that though with the winter approaching fast. I made three new compost piles with grass and straw and most recently now chicken manure & bedding – yes that’s right we have four new residents – four lovely red hens (Red Stars) – donated to me by a friend with a CSA! We built (an experience that is a story in itself) a cute chicken house (that matches our house) and are happily collecting eggs – so far so good. The girls are entertaining and seem happy, although I feel bad that the run I built is a little small – it was supposed to be moveable so they could have new pasture every day, but we need to work out how to make the house moveable too (very heavy), that is a Spring job I think. I was recently very satisfied by my ability to feed our visiting friends two weeks in a row with food almost exclusively from the winifredslittleacre – big egg-centered breakfast, then later a roast dinner consisting of meat (locally grown) and a medley of roast vegetables – including sweet potatoes, swede (rutabaga), turnip, potatoes, parsnip, butternut and delicata squash. Followed by peach crumble (using peaches from our tree frozen in syrup). Delicious! I have already started planning for next year – those seed catalogues have begun to arrive already – sooo tempting all the different varieties, etc. I am planning a couple of different edible landscapes this year so I have to take a slightly different outlook on the plants – I will look at their aesthetic value as well as their functionality. I also want to save some more seeds this year, so I will have to be more diligent about choosing open pollinated varieties. I haven’t decided if I am going to try and sell more produce next year – I have to do some survey work and talk to a couple of people yet. I did start to add up the value of all the vegetables and fruit that I grew this year – so far the total was over $1000! Which is great – I have to go back to my plans and see how the actual production compared to the quantities I was aiming for – more on that later!